An illustrated guide to the Venezia Santa Lucia train station, or Ferrovia, in Venice's historic center. 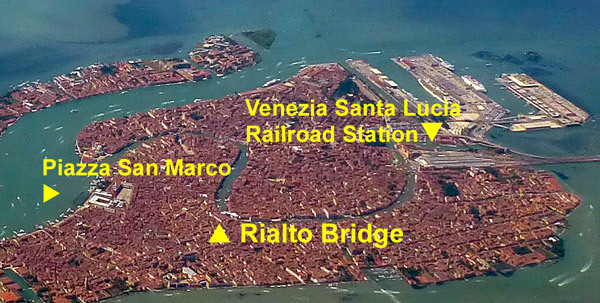 ABOVE: This aerial photo shows the location of Venezia Santa Lucia Railroad Station in relation to two of Venice's most famous tourist landmarks. 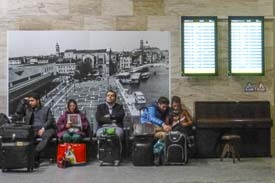 First things first: The term "Venice Railroad Station" is a misnomer, because the municipality of Venice has two major stations: Venezia Mestre station on the Italian mainland, and Venezia Santa Lucia station in the city's historic center (which is 6 km or 4 miles offshore in the Venetian Lagoon). Mestre is a through station where trains stop briefly on their way from Austria and Slovenia to Bologna and Florence. Some trains cross the causeway from Mestre to the Santa Lucia station; others require passengers to disembark in Mestre and catch a local train into the historic center. It's wise to check your train's timetable before departing for Venice, just so you'll know where to get off the train. ABOVE: Venice's Santa Lucia Railway Station is near the foot of the Grand Canal, just behind the Ferrovia vaporetto station. From Mestre, a brick-and-stone causeway named the Ponte della Libertà, or "Bridge of Liberty," crosses the Venetian Lagoon to central Venice. Trains dead-end in the Stazione Ferroviaria Santa Lucia, a stark white building from the 20th Century that looks out of place in a city where most buildings are hundreds of years old. The station's façade is decorated with the logo of the FS, or Ferrovie dello Stato, a.k.a. Italian State Railways. Inside, you'll find the usual services, including plenty of shops that have been added in the last few years.